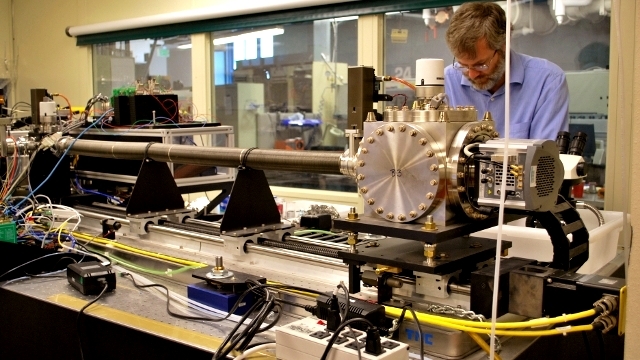 Physicist Mark LeGros spent three years building this microscope which uses x-rays to take 3-D images of biological cells. Mark LeGros, who spent three years building the world’s first x-ray microscope dedicated to cell biology, greeted me at the Lawrence Berkeley National Laboratory (LBNL) with a hearty handshake, effusive smile and an accent reminiscent of his New Zealand roots. I spent an hour in April talking with him about the challenges and rewards of creating a powerful, state-of-the art microscope which can capture a truer, more accurate picture of a whole cell and its nucleus, mitochondria and other tiny, essential cellular structures. I asked him to take me back to that moment in 2009 when he and the diverse team of researchers, including biologists, physicists, chemists and computer scientists, who comprise the National Center of X-ray Tomography at LBNL, powered up the microscope and waited anxiously for the first x-ray images of a yeast cell, the biological specimen they chose to test the capabilities of their new imaging tool. 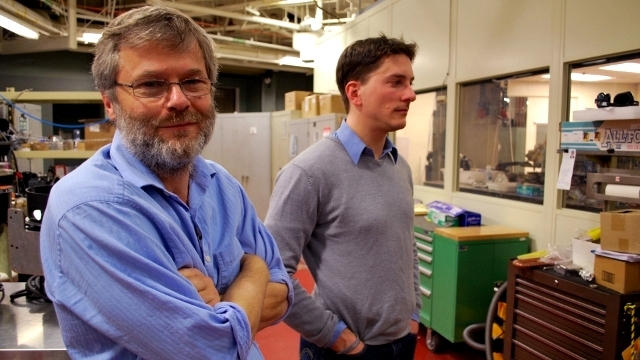 Physicist Mark LeGros smiles for the camera while Bertrand Cinquin, a postdoctoral researcher, waits outside the lab containing the x-ray microscope. Photo by Sheraz Sadiq / QUEST. “I wasn’t sure exactly just how well this was gonna work out. But it turned out that it was beautiful…and everybody associated with the project was stunned with the degree of detail that it revealed about the internal structure of a cell and the chromatin, which is the genetic material of the cell,” he said. 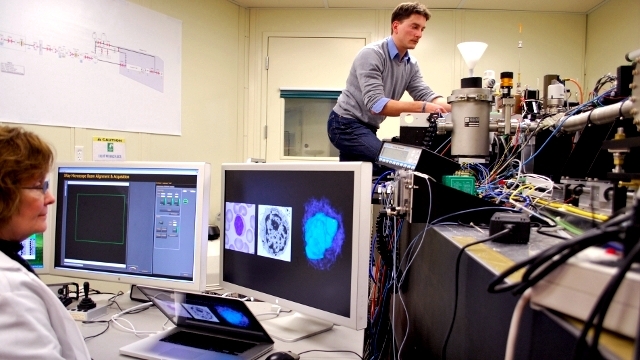 It’s important to note that this powerful device does not render obsolete other imaging techniques, including light microscopy and electron microscopy. For one thing, the cell sample is frozen to hold the structures in place and protect them from the x-rays which have much greater penetrating power than visible light because x-rays have shorter wavelengths than light rays. So it can’t capture dynamic activity of cells moving in real-time, unlike an optical or light microscope. Also, while the resolution possible with the x-ray microscope is five times greater than a light microscope, an electron microscope, which uses electrons to penetrate ultra-thin sections of cells, provides better resolution than the x-ray microscope. Carolyn Larabell looks at images taken with the x-ray microscope while Bertrand Cinquin loads a sample of cells into the microscope. Photo by Sheraz Sadiq / QUEST. Nonetheless, unlike an electron microscope, the x-ray microscope allows scientists to image a whole cell in its native state, with the only preparation being the freezing of the cell sample. 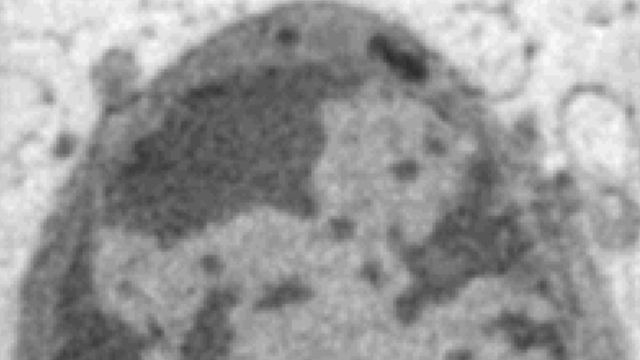 Also, many of the classic textbook images of cells that were taken with electron microscopes which required the cells to be dehydrated and stained with heavy metals to bind the electrons to the cell and generate a rather grainy image. Since a cell is 70% water, dehydration and staining can degrade delicate cellular structures and thus make it hard to accurately visualize them. In addition, the x-ray microscope uses the technique of tomography to faithfully reconstruct the volume of a cell in three dimensions, instead of a flat, 2-D image of it. Here, a sample of cells is placed in the microscope and rotated 360 degrees. While it rotates, x-rays illuminate the carbon and nitrogen present in all biological cells and black and white images then display the absorption of the x-rays by the organic material in every part of the cell. All of this happens in about 30 seconds. 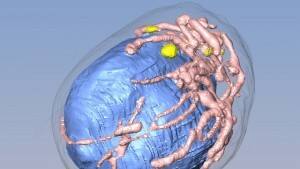 Computer software then allows the team to process, in a mere five to ten minutes, the individual x-ray images and reconstruct a 3-D portrait of the cell which is possible since the cell has been imaged from every conceivable angle, allowing not only the shapes of its structures to be seen but also the amount of biological material such as the DNA packed into the cell’s nucleus. A cross-section of stacked x-ray images taken of a mouse olfactory neuron, with the dark regions indicating the inactive genetic material and the light regions indicating the active genetic material within the nucleus. Image courtesy of Carolyn Larabell, PhD. This novel form of 3-D imaging is revealing new insight into the organization of the active genes – the euchromatin – and the silenced genes – the heterochromatin – in the nucleus. “So we can see now for the first time that the heterochromatin, or those silenced genes, are more crowded than the euchromatin regions. And we can actually quantify that and say that it’s 28% more crowded,” said Carolyn Larabell, a microbiologist and the Director of the National Center for X-ray Tomography. 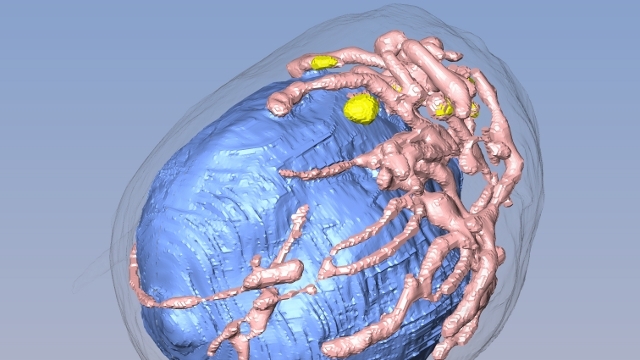 The stack of x-ray images taken of the mouse olfactory neuron is then processed by computer software and turned into this striking 3-D illustration of the cell, with the nucleus shown in blue. Image courtesy of Carolyn Larabell, PhD. So why is it important to quantify the amount of active genes versus silenced genes in a cell’s nucleus? For one thing, in certain diseases like cancer, previously silenced genes become active and the nucleus grows larger. So perhaps this new level of insight can shed light on the progression of cancer and perhaps even offer an early tool for its onset, well before symptoms appear. A three-dimensional window into cells may also lead to the development of better designed and consequently, more effective drug treatments. 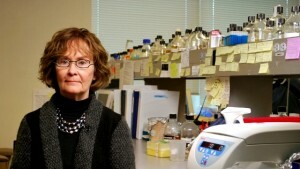 Carolyn Larabell is a microbiologist and the Director of the National Center of X-ray Tomography at LBNL. Photo by Sheraz Sadiq / QUEST. “It’s important to see these structures in 3-D (because) you want to test drugs on cells to see if they’re having the effect that you think they are,” said Larabell. “If you get a single section, you have just a very thin window on what might be happening to that cell. (So) you want to see what’s happening throughout the entire cell,” she added. Whether it’s the life cycle of the deadly malaria parasite or the breakdown of sugars from plants in the production of biofuels, this exciting new imaging tool is providing a richer understanding of important biological processes. But as ingenious as this microscope is, it can’t compare to the ingenuity and complexity of the microscopic world of cells which we’ve strained to bring into lucid focus for hundreds of years, ever since Robert Hooke’s 17th-century descriptions of the tiny structures in a section of cork, which he likened to the modest chambers, or cells, of pious monks.